Visit us at the PLTW Summit 2014! We are at the 2014 PLTW Summit in Indianapolis this week! Stop by our booth to say hi and ask us questions. We also have our latest iPad app, Robot Virtual Worlds Expedition Atlantis, available to try out. And there is a ROBOTC Maze Challenge where you can program a VEX IQ robot using ROBOTC Graphical. 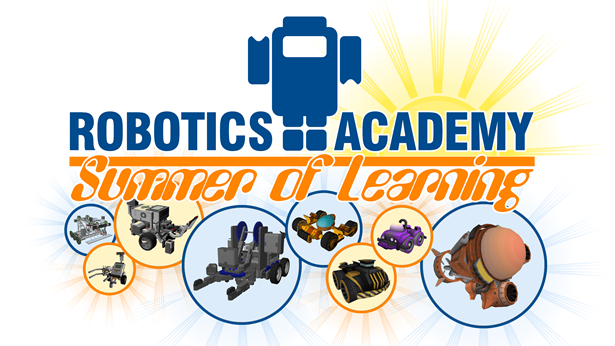 Robotics Summer of Learning Starts Next Week!! Our Robotics Summer of Learning (RSOL) course opens this Sunday, June 15 with our first live webinar course starting on Monday, June 16! The RSOL gives students the opportunity to learn how to program robots using a free copy ROBOTC 4.0 (including the new Graphical Natural Language) for Robot Virtual Worlds programming software. If you’ve always thought that ROBOTC was too difficult, you should try out the new Graphical Natural Language, which is part of ROBOTC 4.0! June 16: Introduction to Software, Setup, Forums and Procedures used in this course. All courses will be held at 1:00 PM Eastern Standard Time with a live instructor. A link will be available in the CS2N Moodle course for each session. All sessions are recorded so that you can take the course at your own pace. These dates are subject to change. And don’t forget to sign up for our Robotics Summer of Learning Newsletter to get important reminders and information throughout the summer! Copyright 2005-2013 Robomatter, Inc. All Rights Reserved. All names and trademarks are property of their respective owners.